George Gaskin, who is helping Bridges out for the month whilst top striker Connor French is away on holiday, came off the bench to score twice to help Martin Dynan’s team recover from a two goal deficit in often appalling conditions. 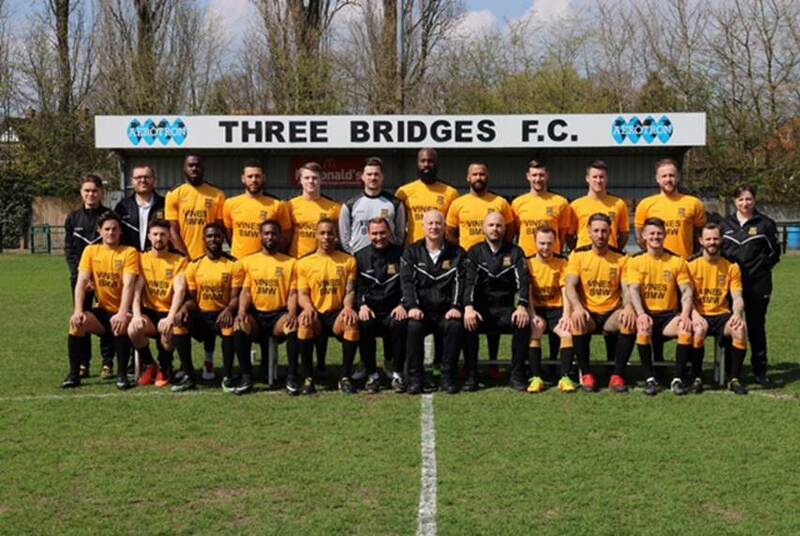 Bridges looked set to continue their recent run of good form as they attacked down the slope, but Alex Clark, Brannon O’Neill and John Ufuah all failed to finish after creating good chances for themselves. And they were punished after thirteen minutes when James Shaw rather clumsily felled TT Walters. The foul looked clearly outside the box but the Assistant Referee signalled that the offence had occurred inside the area and a penalty was awarded. Even then, Shaw managed to get a hand to the spot kick, but Reece Deakin’s shot sneaked past the Bridges keeper, who proceeded to make three excellent saves as Greenwich, themselves having a bit of a revival, created some decent chances. Ufuah came close after good work by Clark and Nathan Simpson, but generally Bridges seemed well below the standard they had set in the last few weeks. And it got worse for them after 36 minutes when a swift counter attack ended with Ryan King-Elliot sweeping the ball home to cause mass celebrations by the home side. Regan Mendes was leading his defence well for Borough, but in the 67th minute he could do nothing as Ibby Akanbi delivered the ideal cross for Gaskin to guide past Thomas McGill. Bridges’ own defence was now far steadier with Antone Douglas and Joe Tennant again looking supreme, and Bridges received a boost when Reece Cave received his marching orders with nine minutes remaining. They took full advantage just two minutes later as Lee Hall delivered another inviting cross, and Gaskin needed no further encouragement as he glanced a header beyond a desperate McGill. Jensen Grant and Ikanbi both hit shots wide as the visitors went for a winner that had looked unlikely for long periods, but a draw was probably a fair result overall. Aerotron Man of the Match: Joe Tennant. Bridges make the long trip to Guernsey this coming Saturday (22nd).